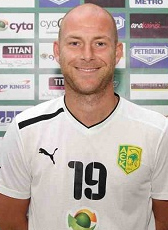 Former Dutch international Tim de Cler moved abroad in June 2011. After spending four season at Feyenoord, he agreed a 2-year deal until 2013 on the isle of Cyprus at the club of fellow Dutchman Jordi Cruyff and Ton Caanen. In summer 2013 De Cler decided to hang up his boots and retired as a professional player at the age of 34-year.